Rivalry Showcase 2008 Promo Trailer. Click above to watch, or watch on Vimeo for a larger version. We did not release Rivalry Showcase 2008 on DVD because Rivalry wasn't doing as many releases anymore. John did still edit the footage and put the finished product online for free. 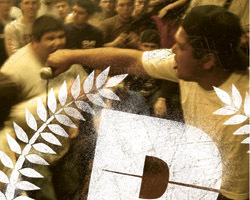 The film from each band's set at Rivalry Showcase 2008 is linked further below. 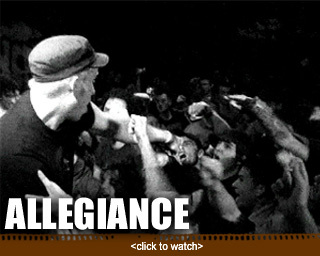 Allegiance @ Rivalry Showcase 2008. Click above to watch, or watch on Vimeo for a larger version. Another Breath @ Rivalry Showcase 2008. Click above to watch, or watch on Vimeo for a larger version. Betrayed @ Rivalry Showcase 2008. Click above to watch, or watch on Vimeo for a larger version. Ceremony @ Rivalry Showcase 2008. Click above to watch, or watch on Vimeo for a larger version. The First Step @ Rivalry Showcase 2008. Click above to watch, or watch on Vimeo for a larger version. Get The Most @ Rivalry Showcase 2008. Click above to watch, or watch on Vimeo for a larger version. Internal Affairs @ Rivalry Showcase 2008. Click above to watch, or watch on Vimeo for a larger version. Killing The Dream @ Rivalry Showcase 2008. Click above to watch, or watch on Vimeo for a larger version. 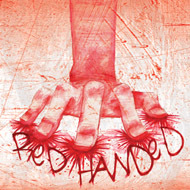 Red Handed @ Rivalry Showcase 2008. Click above to watch, or watch on Vimeo for a larger version. 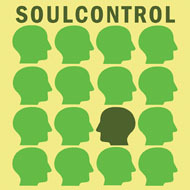 Soul Control @ Rivalry Showcase 2008. Click above to watch, or watch on Vimeo for a larger version. Trash Talk @ Rivalry Showcase 2008. Click above to watch, or watch on Vimeo for a larger version. Verse @ Rivalry Showcase 2008. Click above to watch, or watch on Vimeo for a larger version. John, Duane, and Ross explaining what Allegiance and Rivalry meant to them. Watch this and you'll understand everything I've been saying above about the Rivalry family. Click above to watch, or watch on Vimeo for a larger version. 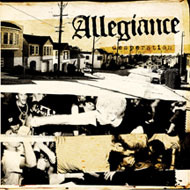 Members of Allegiance discussing the importance of Go It Alone to the Rivalry family. This was included as bonus footage on the Rivalry Showcase 2007 DVD. Click above to watch, or watch on Vimeo for a larger version. 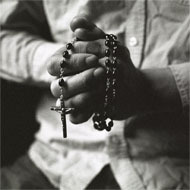 John Eightclip made this promo video for the Devotion project. Click above to watch, or watch on Vimeo for a larger version. Preview trailer for the Rivalry Showcase 2007 DVD. Compiled and edited by John Eightclip at Eightclipmedia.com, this DVD features over 120 minutes of video footage, photo galleries, and bonus features from Rivalry Showcase 2007, including much of GO IT ALONE's final Rivalry Showcase appearance. Special thanks to David at My Resolve for all the help with cameras and filming! You can purchase the DVD here. Trailer video clip for the Rivalry Showcase 2006 DVD! 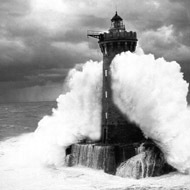 Compiled, directed, authored, and encoded by John Eightclip at Eightclip Media (www.eightclipmedia.com). Special thanks to David My Resolve for the cameras and all the help! You can purchase the DVD in our online store. A longer, extended trailer for the Rivalry Showcase #2 DVD released by Rivalry Records. Edited and compiled by John Eightclip at Eightclip Media (www.eightclipmedia.com). You can purchase the DVD in our online store. 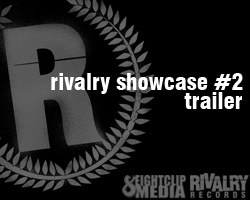 Trailer for the Rivalry Showcase #2 DVD released by Rivalry Records. 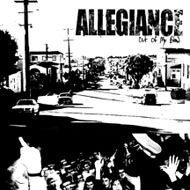 ALLEGIANCE set from THE DAMAGE DONE's last show on October 4th, 2003. 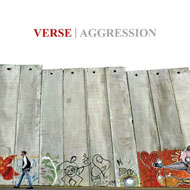 Features short commentary from the band. Compiled and edited by John Eightclip. 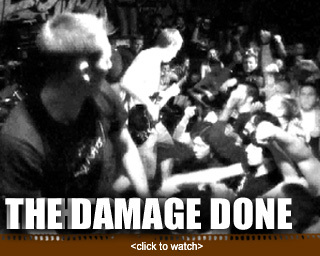 Footage from THE DAMAGE DONE's last show on October 4th, 2003. 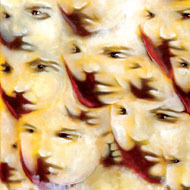 Features a short interview with band members. 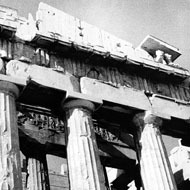 Compiled and edited by John Eightclip. Live music video for "Discount Brick" by Time For Living. 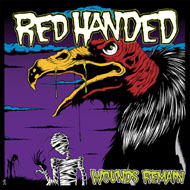 Filmed and edited as a project by John Eightclip at 924 Gilman St.